Are you considering adding a screen room or another patio product to your home in Rochester, New York, or a surrounding area? If so, consider the retractable screen room manufactured by TEMO and offered by the professionals at Pro Home and Sunrooms. We have proudly served the area since 1967 by offering impressive, American-made, outdoor living products that will allow you to spend more time outdoors. And, our retractable screen rooms are no exception. In fact, with a retractable screen room in place, you will have the added benefit of being able to have control over the level of protection from insects and other pests you require. And, if the bugs go away, simply leave the screens up and enjoy your open-air, covered, patio. In addition to the screen rooms that we offer to local homeowners, Pro Home and Sunrooms offers the full range of TEMO products. This means that you can turn to us for a wide variety of outdoor products including sunrooms, patio covers, pergolas, and carports. 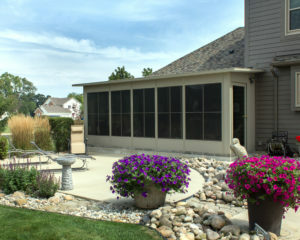 To learn more about the beautiful retractable screen room that we can install at your home in Rochester, NY, or a surrounding area, contact Pro Home and Sunrooms today. Make sure to ask about the financing options available to all qualifying homeowners.